On December 11th, Riot Games released a video for the new League of Legends champion: Camille, an assassin with blades for legs. Camille is a highly mobile fighter who’s very good at pursuing and slaying single targets. A lot of her skills are focused on precision and single target hunting. Her passive, when of cooldown grants her a shield protecting from the main damage type of the first target she hits. If it’s a magic user, the shield will give you bonus resistance to magic, the same will happen if the target is a physical attacker and so on. Her “Q” powers up her next basic attack and gives bonus movement speed, or can be activated again to deal a second more power attack. The “W” is a sweep in a cone, which the outer part of it grants more damage and slow the enemy. And while it takes some time to cast, you can move while prepping it, which helps with positioning. 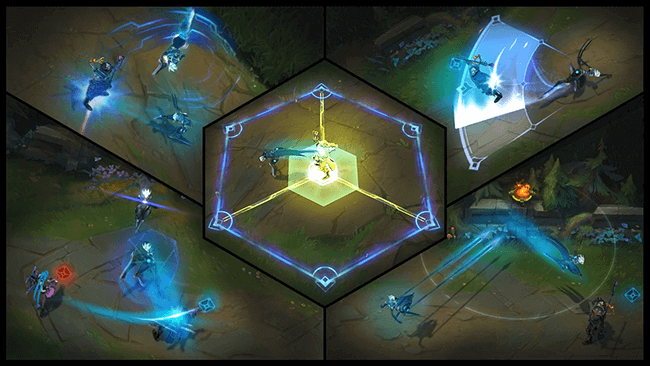 “E” is the main appeal for this character, a hook shoot, that hooks Camille to a wall, and with a second cast repels her to a target position, if an enemy is hit, they are stunned and she gains attack speed. Here ultimate ability is a single target ability, it knocks away the enemy’s allies and traps the target is a zone, that there is no way to escape from, not even with “Flash”. The arena will disappear after a short time, or when Camille leaves the zone. While in the zone, she has bonus magic damage. Overall her strengths are her mobility and the damage possibilities with her abilities. However, her main weaknesses are her low health and her high skill ceiling. Not for players who can’t land the abilities at the right time. Lore wise, Camille is an assassin for Piltover’s underworld, helping the currently established powers. And is described as a calm, relentless, and terribly precise.